After a violent storm in the South Pacific in the year 1643, Roberto della Griva finds himself shipwrecked-on a ship. Swept from the Amaryllis, he has managed to pull himself aboard the Daphne, anchored in the bay of a beautiful island. The ship is fully provisioned, he discovers, but the crew is missing. As Roberto explores the different cabinets in the hold, he remembers chapters from his youth: Ferrante, his imaginary evil brother; the siege of Casale, that meaningless chess move in the Thirty Years' War in which he lost his father and his illusions; and the lessons given him on Reasons of State, fencing, the writing of love letters, and blasphemy. 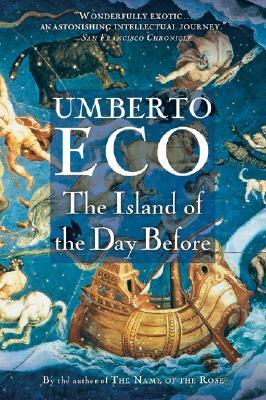 In this fascinating, lyrical tale, Umberto Eco tells of a young dreamer searching for love and meaning; and of a most amazing old Jesuit who, with his clocks and maps, has plumbed the secrets of longitudes, the four moons of Jupiter, and the Flood. UMBERTO ECO (1932–2016) was the author of numerous essay collections and seven novels, including The Name of the Rose,The Prague Cemetery, and Inventing the Enemy. He received Italy’s highest literary award, the Premio Strega, was named a Chevalier de la Légion d’Honneur by the French government, and was an honorary member of the American Academy of Arts and Letters.